Don’t just ride a bike; enjoy the ultimate French cycling holiday experience. VéloRoo is a family business, owned and operated by Australian couple, Steve and Julia. From your first email, contact or phone call you will be talking with one of us. Our goal is to give you a perfect cycling holiday. 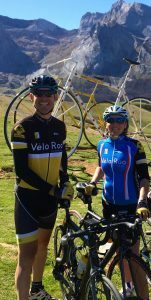 You will have our personal attention throughout the entire tour planning phase, plus a wealth of cycling knowledge and bike holiday preparation tips from Steve and French travel logistics help from Julia. We have our own range of quality road bikes included in your package, so you don’t need to lug your bike around on the rest of your European holiday. Travel smarter and with less stress! And then we get to the real fun part – your idyllic cycling holiday in France – and we are with you all the way! Steve will be your riding buddy and tour guide and Julia is always close at hand with vehicle support and supplies. We will take you cycling on our fantastic, quiet cycling roads, and during our South of France tours we will guide you to a host of fabulous hidden treasures along the way; from local wineries to olive farms, with plenty of picturesque walks to breathtaking lookouts in the balmy afternoons. We will take you to only the best local cafes and restaurants, nearly all of which are run by husband and wife teams and all of which have a true passion for local French food and wines. VéloRoo offers several exclusive, exceptional, personalised, fully-supported cycling adventures each year, coupled with quality, authentic accommodation, gastronomic dining and local cultural events. We bring you a dynamically balanced French experience, containing both cycling fun and sightseeing – perfect for couples with a non-cycling partner. You know you’re doing cycling holidays right when your guests return for their 3rd and 4th tour with you, year after year! We can’t wait to do the same for you, and make your dream cycling holiday a reality.